What is green and bitter and that we find absolutely irresistible? Matcha, or powdered green tea! We love it brewed or used in baking. 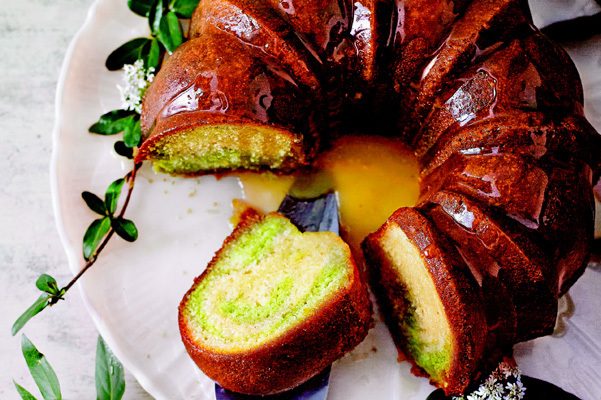 And since we are “thinking green” for St. Patrick’s Day, we thought we would re-visit this simple, lovely Bundt cake. By the way, matcha can be pricey, but you can find lesser expensive baking grades. You don’t have to buy the premium matcha used for the tea ceremony. We are big fans of matcha, which is finely ground green tea classically used in the Japanese tea ceremony. Its bitter flavor and brilliant green color lend itself very well to baking applications such as in our shortbread cookies. Here it is beautifully blended with honey and milk, which temper its bitterness and create a gorgeous, yet simple cake. 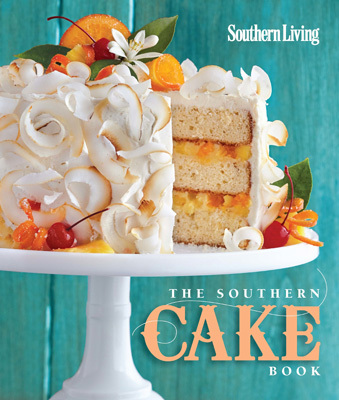 This recipe is from The Southern Cake Book, which has an entire chapter called Pretty Pound Cakes that we are crazy about! We recommend buying the book for that chapter alone where you will find Coffee Baba au Rhum, Black Forest Pound Cake, Lemon Coconut Loaf Cake and several others. Gorgeous pictures of each one. Also check out the Caramel Apple Cheesecake. Hands-on: 30 min. • Total: 3 hours, 15 min. Matcha, a Japanese green tea powder, adds vivid green color and a delicate flavor. Look for it in Asian grocery stores and gourmet markets, or order it online. Store it tightly covered in the fridge. If you can’t find matcha, pulverize regular green tea in a spice grinder. For the Cake: Preheat oven to 325°. Beat butter and shortening at medium speed with a heavy-duty electric stand mixer until creamy. Gradually add sugar, beating until light and fluffy. Add honey, beating until blended. Add eggs, 1 at a time, beating just until blended after each addition. Stir together flour and next 2 ingredients. Add to butter mixture alternately with milk, beginning and ending with flour mixture. Beat at low speed just until blended after each addition. Transfer 2½ cups batter to a 2-qt. bowl, and stir in matcha until blended. Drop 2 scoops of plain batter into a greased (with shortening) and floured 10-inch (12-cup) Bundt pan, using a small cookie scoop (about 1½ inches); top with 1 scoop of matcha batter. Repeat procedure around entire pan, covering bottom completely. Continue layering batters in pan as directed until all batter is used. Bake at 325° for 1 hour and 5 minutes to 1 hour and 15 minutes or until a long wooden pick inserted in center comes out clean. For the Glaze: Bring all of the glaze ingredients to a boil in a 1-qt. saucepan over medium heat, stirring often; reduce heat to medium-low, and boil, stirring constantly, 3 minutes. (Makes about 1 2⁄3 cups). Remove cake from oven, and gradually spoon 1 cup hot Honeysuckle Glaze over cake in pan, allowing glaze to soak into cake after each addition. Reserve remaining glaze. Cool cake completely in pan on a wire rack (about 1 hour and 30 minutes). Remove cake from pan; spoon reserved glaze over cake. For best results we say do seek out the matcha as opposed to trying to grind green tea yourself.